AV Bros. Page Curl Pro 2.2 is a multi-purpose and extremely powerful Photoshop plugin. (Photoshop plugin (also known as Photoshop plug-in) means the filter plugin (8bf) for Adobe Photoshop and compatible hosts such as Adobe Photoshop Elements Adobe Image Ready Adobe Fireworks (formerly Macromedia Fireworks) Corel Paint Shop Pro Corel Photo-Paint Ulead PhotoImpact etc.) AV Bros. 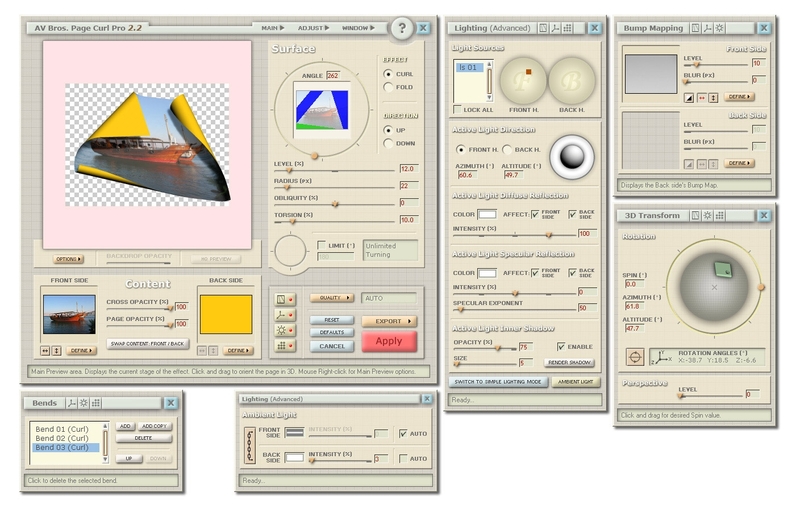 Page Curl Pro 2.2 is fully compatible with Photoshop CS3 including support of the Smart Filters option of CS3. Mac users should be aware that Page Curl Pro 2.2 is now Universal application. It has the ALL NEW and unrivalled engine that lets you not only bend the image using two type of bending (curling and folding) but also texturize it (using the bump maps) orient it in 3D space (including the perspective distortions) and obtain total control over the process of lighting the image (including the option of dropping inner shadows. Using AV Bros. Page Curl Pro 2.2 you can create a wide range (from a very simple to a highly complex) of amazing effects! Moreover some of them are practically impossible to create without this Photoshop plugin. Thanks to the convenient and aesthetically pleasing User interface usage of this Photoshop plugin is not only efficient but enjoyable as well.